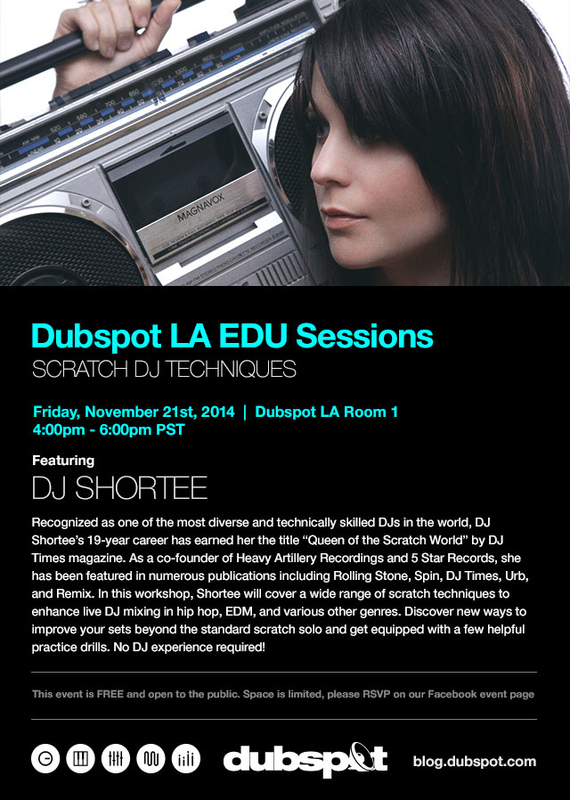 On Friday November 21st our Dubspot LA EDU Fall Sessions continue with a special workshop on scratch DJ techniques with the world famous DJ Shortee (Heavy Artillery, 5 Star Records). As a wise MC once pondered, “What is a DJ if he (or she) can’t scratch?” Knowing how to manipulate the physical side of your equipment can really bring new life to your DJ performances and win respect from the crowd. For this special Dubspot LA workshop focused on scratch DJ techniques, we are proud to introduce DJ Shortee (Heavy Artillery, 5 Star Records) - one of the best scratch DJ’s in the world and a pioneer in the world of turntable performance. In this workshop Shortee will cover a wide range of scratch techniques to enhance live DJ mixing in hip hop, EDM, and various other genres. Discover new ways to improve your sets beyond the standard scratch solo and get equipped with a few helpful practice drills. No DJ experience required! This event is FREE and open to the public. Space is limited, please RSVP on our Facebook event page.